Hi everyone!! My name is Rachael Reilly and I’m from Indiana, Pennsylvania. I’m currently a High School Business Teacher at Clarion-Limestone – on the other side of Pennsylvania! This will be my fifth summer at Chenny and I’ll be returning as one of the Girls Side Assistant Head Counselors! I started my Chenny adventure back in 2014! One of my best friends, Shelby Runyan, and I started our journey together. As we drove up to camp for orientation, we both second-guessed our decision. We were about a minute away from camp and SERIOUSLY considered turning around and driving home. 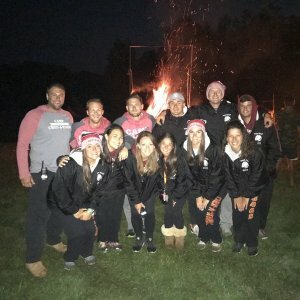 What were we thinking working at a summer camp all summer? What if they don’t like us? What if we hate it? BOY WERE WE WRONG. Summer 2014 ended up being one of the best summers of my life and I have never regretted my decision. 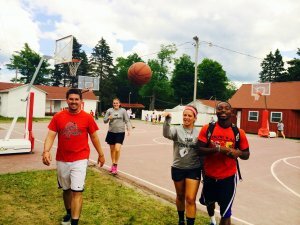 During my first summer at camp, I was a Basketball Specialist and a counselor for the GC girls. Little did I know, these girls would become some of my best friends – I still stay in contact with most of them to this day! I was given the opportunity to be a Captain for Olympics (Go Madagascar) and then a Lieutenant for Color War (Gold Zombies)! Both of these events were easily the most exhausting and most rewarding times for me at camp! 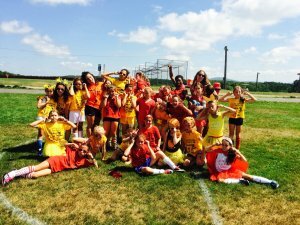 The next summer, I became a Group Leader for the youngest girls on camp, the Freshmen. Talk about opposite ends of the spectrum! 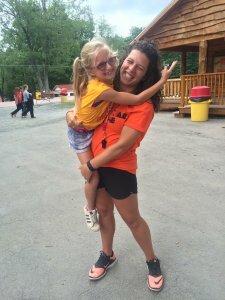 I went from some of the oldest girls on camp to the youngest girls on camp – I was nervous, to say the least. As much as I didn’t want to admit it at times, I ended up loving the younger age group. During my third summer, I was the Group Leader for the same girls, when they moved up a division to Juniors. 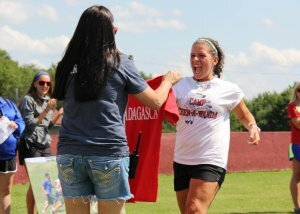 Which leaves me at my current position at camp, Girls Side Assistant Head Counselor! During my previous four years at camp, there were countless times where I literally couldn’t believe that I was getting paid to do what I was doing. Trapeze? Climbing Tower? Tubing? Dancing on tables at meals? Got paid for it all of it. There were times where it literally didn’t seem real. Wearing a red and gold tutu around camp…and it being socially acceptable? Sure, why not? Camp was really a life-changing experience for me. I truly believe that I wouldn’t be half the person I am today without the experiences and friendships that I’ve gained through camp. The friendships that I have made at camp are irreplaceable. Those people are always there for me, literally whenever I need them. Whether it’s a Facetime call from my campers or group texts with my co-counselors, I always have someone there. I have hundreds of friends from all over the world and that’s something that I’m extremely thankful for. I talk about the people I’ve met at camp in my classroom all the time – my students are always so baffled that I know people from all over. So all in all, I was able to find myself during my few years at Chen-A-Wanda. I grew into the person that I needed and wanted to be. I couldn’t be more thankful for Jon, Elissa, Brian, and Laura, (and the countless people that I’ve met over the years) for giving me the opportunity of working at Camp Chen-A-Wanda. I am forever grateful and thankful for Camp Chen-A-Wanda.